Welcome to St. Robert School in Flushing, where we offer a quality, Catholic Christian education to students in preschool through 8th grade. Our goal at St. Robert School is to give our students an excellent education that will enable them to better serve the Lord and become disciples of Christ. Our unique combination of cutting-edge facilities and equipment, with a nurturing, student-centered approach, creates a rich foundation for tomorrow’s leaders. It is our objective to educate the whole child. To do this, we provide academic excellence, faith formation and a full-spectrum of extracurricular activities that enable students to learn about teamwork, personal achievement and the pursuit of excellence in all areas of their lives. If you are looking for a nurturing and stimulating environment where your child is encouraged to be respectful, yet inquisitive and hands-on, look to St. Robert School. 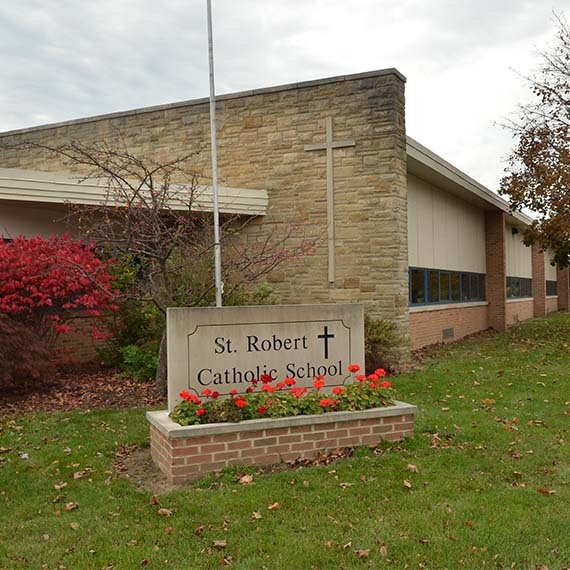 St. Robert Catholic School is a faith community dedicated to the ministry of nurturing a child’s relationship with God while promoting academic excellence in the 21st century. We recognize the dignity of each child and challenge our students to live the Gospel. In partnership with parents, students are challenged to grow spiritually, intellectually and socially. Entrusted with the teachings of Christ, we seek to guide our students to a virtuous and holy life. St. Robert School exists to make smart saints. 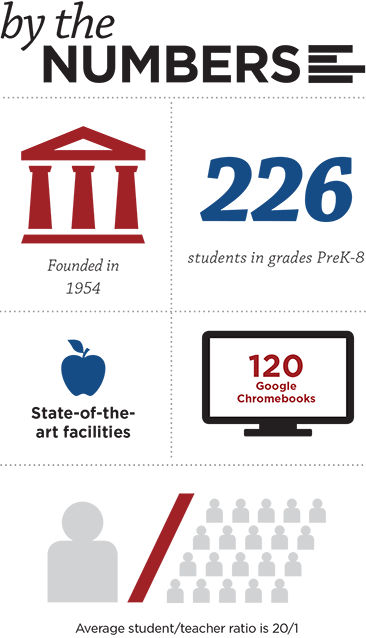 Along with our nurturing environment and faith formation and excellent academic programs that build on the basics and incorporate the latest in interactive technologies, including 120 Google Chrome books and classroom SMART Boards. Our project-based learning and community approach makes St. Robert School a place where every student excels. Our interconnected curriculum includes not only the core subjects of science, math, social studies and language arts; but also art, music, band, Mythbusters, broadcasting and Spanish. At St. Robert School, we have a unique, Montessori-based religious education program called the Catechesis of the Good Shepherd. Rooted in the Bible and liturgy of the Church, this allows students to learn about the Christian faith through hands-on materials in our three grade-appropriate atriums — special rooms with simple beautiful educational and religious materials to help students develop their understanding and relationship with Christ. This is enhanced by our buddy program which pairs older students with younger. Students also engage in monthly Christian service projects with activities such as collecting and donating needed items such as food, socks, soap and shampoo to Catholic Charities of Flint. Whether your child is interested in music, books, or basketball, St. Robert School offers a wide range of activities. School-wide events include the Mock Rock talent show and the spring musical. We also offer art club, band, Book Bowl, FLL Robotics, student council, Scouts and more. Students in 5th through 8th grade can participate in sports. St. Robert School sponsors athletic teams in a variety of sports including football, cross country, girls and boys basketball, volleyball, baseball and softball.